Dietary Supplements « Global Market Insights, Inc.
Vitamin E market outlook: Cosmetics & Dietary applications to offer dynamic growth opportunities over 2016-2024. Shifting consumer focus toward health and wellness benefits from vitamins consumption will surge the global vitamin E market. Increasing consciousness of adopting healthy food habits coupled with rise in spending capacity will significantly stimulate the vitamin E industry. According to Global Market Insights, Inc., “Vitamin E market size is estimated to grow at a CAGR of 3.5% over the period of 2016-2024.” Vitamin E has many benefits to the human health, including regulation of blood pressure, reproduction system, and in prevention of health problems. The trend of maintaining a healthy lifestyle which includes dietary supplements along with regular diets is equally popular across the developed as well as the developing economies. In addition to this, rising disposable incomes in these regions will boom the vitamin E industry in the coming years. Furthermore, growing geriatric population base in U.S., Europe, and Japan has multiplied the use of medications for the cure of disorders coupled with precautionary supplements which will help to stay healthy and fit. This scenario has stimulated the need for mandatory intake of vitamin E from supplementary sources fueling the vitamin E market size. Based on products, vitamin E market is segmented into synthetic vitamin E and natural vitamin E. Natural vitamin E is further categorized into Tocopherol and Tocotrienols by products. Tocopherol is naturally found in fish, vegetable oils, nuts, and leafy vegetables. Tocopherols is projected to surpass USD 300 million by 2024, owing to rise in per capita income and consumers’ willingness to spend more on nutrition and dietary supplements. Europe and U.S. are the largest contributors to the overall consumption, as the majority of the population is inclined towards maintaining healthy lifestyles in turn boosting the vitamin E industry. U.S. vitamin E market is set to witness escalating gains, owing to healthy food consumption and high disposable income. Moreover, healthcare regulations are also contributing in driving the regional growth. 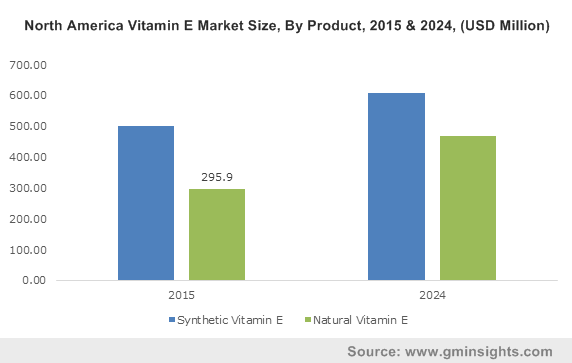 U.S. vitamin E market generated revenue over USD 50 million in 2015 and is estimated to grow considerably in the coming seven years. Europe vitamin E market is projected to expand significantly due to increase in consumption of dietary supplements. Moreover, rising demand for high protein diets, particularly in Russia and Germany has slated the Europe animal feed market size. Rising prescriptions and recommended health supplements from the health professionals will further complement the regional industry growth. Cosmetics applications in the vitamin E market is witnessing high growth rate increasing at 7% over the period of 2016-2024. The willingness to pay more for the products which prevents skin ageing and assures various other skin benefits with UV protection & moisture content for healthy and youthful skin will generate huge scope for vitamin E industry share in the coming seven years. Its usage in sunscreen and other cosmetics products where vitamin E helps in reducing inflammation on the skin will escalate the industry growth over the coming timeframe. Dietary supplements application is another lucrative segment assuring heavy gains in the vitamin E industry. Rising demand for nutritional edibles in the form of powders, liquids, tablets, pills, and capsules particularly in the western countries will spur the vitamin E market growth. Dietary supplements vitamin E demand is expected to register a CAGR of 4% over the period of 2016-2024. Reduction of migraine headaches, strengthening of the immune system, controlling blood pressure levels, and protection from flu and cold are the major benefits obtained from the consumption of these dietary supplements. Another profitable segment in the vitamin E industry is the animal nutrition market, which was worth USD 1 billion in 2015. Growing meat export from Asia Pacific countries will generate animal nutrition demand. Rising prevalence of livestock diseases has enabled the usage of better animal nutrition in turn driving the vitamin E market. Moreover, rising cattle breeding in China, India, Russia, and Brazil will generate heavy demand for Animal feed additives market. Synthetic vitamin E is a major product used in animal feed industry. Asia Pacific dominated the global meat production, which was projected to be over 130 million tons. China vitamin E animal nutrition market worth USD 70 million in 2015, is anticipated to surge noticeably over the coming seven years. Presently the vitamin E industry is highly competitive with emerging markets from India and China. Moreover, many other industry participants are focusing on investigating substitute sources to improve the characteristic of vitamin E. The vitamin E market share is consolidated with top five industry participants catering to 50% of the global demand in 2015. The major market players include COFCO Tech Bioengineering DSM, BASF, American River Nutrition, Cargill, and ADM. This entry was posted in FOOD, NUTRITION AND ANIMAL FEED and tagged animal nutrition, Beverages, Cosmetics, Dietary Supplements, Functional Food, Global Vitamin E Market, Human Nutrition, Natural Source Vitamin E Market, Natural Vitamin E, Synthetic Vitamin E, Tocopherol, Tocotrienols, Vitamin E, Vitamin E Market, Vitamin E Market Share, Vitamin E Market Size. Rampant application of carotenoids across food & beverages, cosmetics, pharmaceuticals, and animal feed industries has fueled carotenoids market size. According to Global Market Insights, Inc., “Global carotenoids market share is projected to surpass USD 300 million by 2024.” Heavy use of carotenoids in the nutraceutical industry, owing to its positive effect on immune & cardiovascular system are expected to boost the carotenoids industry trends over the coming years. Higher spending on medical & healthcare insurance services along with the growing life expectancy of aging population is further expected to stimulate the global industry size over the next few years. Carotenoids act as a main precursor for amino acids in animal feeds and possess anti-oxidative characteristics, further enhancing its demand across animal feed additives market. Major carotenoids products comprise lycopene, beta-carotene, astaxanthin, lutein, and canthaxanthin. Beta-carotene industry size worth USD 40 million in 2015, is forecast to register an annual growth rate of 4% over the coming seven years. Heavy product demand can be attributed to its increasing usage as an essential ingredient in diets, to avoid ailments pertaining to the eyes, heart, and skin. Canthaxanthin, which contributed towards nearly 10% of the global carotenoids market share in 2015, is projected to witness a high surge over the next few years due to rising consumer preference for bakery items, snacks, breakfast cereals, fruits, and baby ingredients. Moreover, its extensive usage across cosmetics industry due to its anti-tanning properties will further stimulate the product demand over the coming years. Lutein is another major carotenoid product, forecast to witness a substantial growth in the near future. 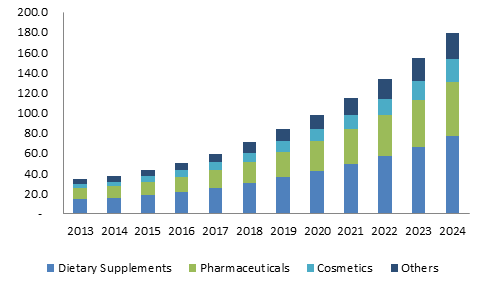 The growth will primarily be driven by its high demand across pharmaceuticals, food, dietary supplements, nutraceuticals, and animal feed applications. 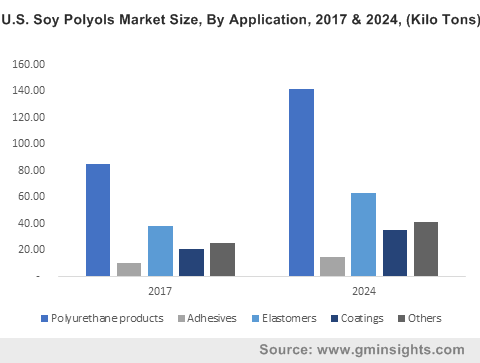 Lycopene industry worth USD 15 million in 2015, is expected to grow considerably over the next few years due to its high application in cosmetics and pharmaceuticals sectors. Shifting focus of consumers towards natural products has pushed growth of natural carotenoids market. Natural carotenoids industry size is expected to register a CAGR of 4% over the period of 2016-2024. The other prominent extraction of carotenoids is from the synthetic sources. Synthetic carotenoids market dominated the source landscape with a market value of USD 190 million in 2015. Low production cost and easy availability of synthetic resources will boost its industry share over the forecast timeframe. Carotenoids market size in food & beverage sector is anticipated to grow substantially over the forecast period, owing to its large-scale application as food additives globally. Animal feed sector, which accounted for nearly 30% of the overall carotenoids market share in terms of volume, is projected to grow considerably over the coming years. The growth can be credited to its high nutrient content and improved taste. Growing consumer preference towards healthy meat appearance is expected to boost the carotenoids industry growth. 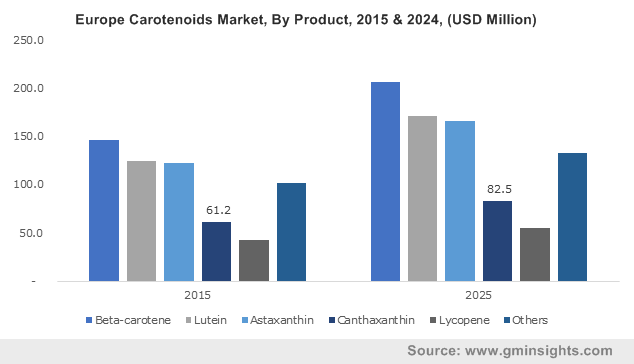 LATAM carotenoids market is expected to witness a considerable growth over 2016-2024, owing to changing lifestyles, rise in per capita income, and high consumer awareness about the benefits of product use. Argentina, Peru, Brazil, and Chile are expected to be the key growth drivers of the region. Europe carotenoids industry will witness a substantial surge over the coming years due to the rapidly expanding food sector along with heavy product use as food coloring agent. Russia, Germany, Italy, and France are likely to be the key revenue pockets of the region. Middle East & Africa carotenoids market is projected to witness a significant growth over the next few years, owing to rise in the aging population as well as high demand for the product across health supplements sector. Market players will try to enhance their share by adopting business strategies such as product differentiation and high R& D investments. Key carotenoids industry players include Cyanotech Corporation, Allied Biotech Corporation, Chr. Hansen, Divis Laboratories Limited, D.D. Williamson, and Naturex Company. This entry was posted in FOOD, NUTRITION AND ANIMAL FEED and tagged Animal Feed, Astaxanthin, Beta Carotene Market, Beta-carotene, Beverages, Canthaxanthin, Carotenoid Market Size, Carotenoids Market Share, Carotenoids Market Trends, Cosmetics, Dietary Supplements, Food, Global Carotenoids Market, Lutein, Lycopene, Natural, Pharmaceutical, Synthetic. Global Coenzyme Q10 (CoQ10) Market size produced $351 million in terms of revenue for 2015 and may register CAGR of more than 10.1%. Strong application overview in cosmetics as well as medical sector in APAC and Europe is projected to promote industry expansion. The product is extensively used in sunscreen lotion and anti-aging cream preparation to avoid skin damage by free radicals. Growing aging population can propel demand for food supplements and anti-aging creams. All these factors can fuel global coenzyme Q10 (CoQ10) industry trends. Furthermore, growing pollution and rising concerns about ultraviolet radiation effects on skin is projected to promote demand of sunscreen lotion. Product application in treating neurological ailments, kidney failure, periodontal and cancer is projected to propel global coenzyme Q10 (CoQ10) market growth. In addition to this, favorable trends observed in food supplements consumption all across the globe are projected to promote global coenzyme Q10 (CoQ10) market price trends. However, lack of stringent rules in medical therapy can inhibit industry expansion. Tight raw substance supply in form of tryptone, peptone and hexane can affect global coenzyme Q10 (CoQ10) industry price trends. Global Coenzyme Q10 (CoQ10) industry is segmented into cosmetic application, pharmaceutical application and food supplement application. Food supplement segment contributed more than $226 million for 2015. Increasing healthcare awareness due to growing levels of malnourishment is predicted to contribute towards segment growth. Furthermore, consumption of coenzyme Q10 through food supplements enhances blood levels and reinforces antioxidant features that prevents occurrence of major ailments caused due to metabolism problems and cellular oxidative injury. Pharmaceutical application is predicted to experience gains of more than 9.6% during forecast timeline. Favorable effects on Parkinson and Migraine therapies is predicted to drive demand for coenzyme Q10 in this segment. Cosmetics application segment is expected to exceed $141 million by end of forecast timeframe. It is expected to growth as the coenzyme Q10 product is utilized in cosmetics like skin moisturizers and anti-wrinkle products as well as sunscreen lotions. Global Coenzyme Q10 (CoQ10) market is segmented into various regions like North America, APAC, Europe, Middle East & Africa and Latin America. North American industry, led by U.S. Coenzyme Q10 (CoQ10) market, produced more than $201 million revenue for 2015. Beverages and personal care items contributed a key share in U.S. industry growth. APAC, with cosmetic sector expansion in India and China, is projected to record CAGR of more than 10.1%. Rising consciousness about nutritional items coupled with increase in per capita income is projected to boost APAC Coenzyme Q10 (CoQ10) industry growth. Latin America, with growing cosmetic sector in Mexico and Brazil, is projected to promote industry demand. Growing disposable incomes coupled with favorable indicators for medical therapies is anticipated to promote product demand. Key industry participants profiled in the report include Nisshin Sheifun Group Incorporation, PharmaEssentia, Vitamin Shoppe, Healthy Origins, SourceOne Global Partners LLC, Kaneka Corporation, Hwail Pharmaceutical Company Limited, Vitamin Shoppe Incorporation, Gnosis S.p.A, Tishcon Corporation, ZMC USA and Healthy Directions. This entry was posted in FOOD, NUTRITION AND ANIMAL FEED and tagged Coenzyme Q10 Market, Coenzyme Q10 Market America, Coenzyme Q10 Market Size, CoQ10 Market, CoQ10 Market America, CoQ10 Market Size, Cosmetics, Dietary Supplements, Pharmaceuticals.